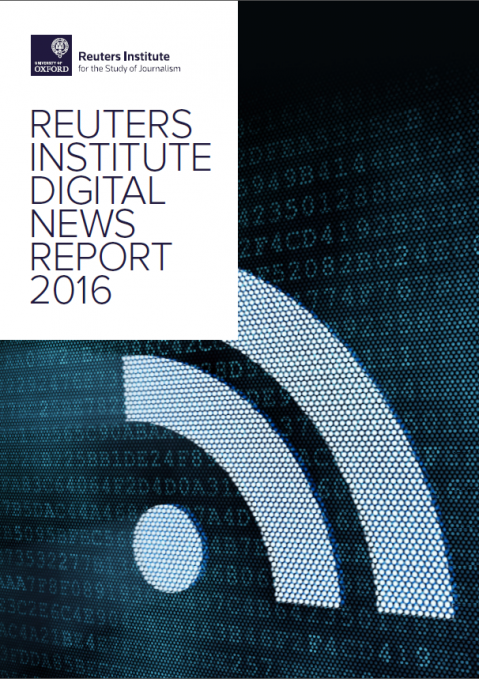 The Reuters Institute’s Digital News Report is the world’s largest comparative international survey of news consumption habits. This year’s report, by Nic Newman, Richard Fletcher, David A. L. Levy and Rasmus Kleis Nielsen, tracks media trends across 26 countries as the international journalism community moves towards an increasingly digital and multi-platform future. The report explores news consumption in: the US, UK, Germany, France, Italy, Spain, Portugal, Ireland, Norway, Sweden, Finland, Denmark, Belgium, Netherlands, Switzerland, Austria, Hungary, Czech Republic, Poland, Greece, Turkey, South Korea, Japan, Australia, Canada and Brazil. As well as country-by country analysis, the report also contains a series of essays from experts including Mark Thompson, CEO, New York Times, Ed Williams, CEO, Edelman UK&Ireland, Alison Preston, Head of Digital Literacy, Ofcom and Rasmus Kleis Nielsen, Director of Research, Reuters Institute. Explore the full report, along with additional essays, a video breakdown and full interactive graphics on our Digital News Report website.